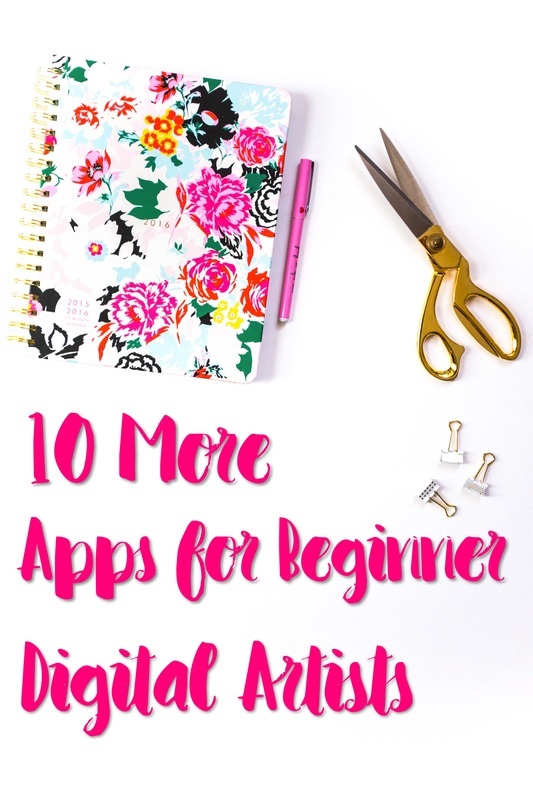 Since my last post I have discovered more easy to use, free, and some not so free (but definitely worth reaching into your pocket for) apps that won't break the bank and will help you get your start as a digital artist. If you like this post, share with others and friends. I use many of these apps on a regular basis to create new and unique designs or reinvent old pieces. I've also included several apps to help you promote your work as well. Remember, the majority of your work isn't just being an artist. While it's important to share your process and your works, it's more important to drive sales. My next post will cover how to drive your sales, and how to get work as a digital artist. I am not in any way being paid by any of these companies to advertise their apps, I'm simply making recommendations to help out my awesome fellow designers and future digital artists to be. If you click on the name of the app below, it will take you to the iTunes store where you can purchase the app. Did anyone else giggle to themselves quietly when they read the name of this app? Just me?...no...,okay..cool beans (*ahem*). Despite the giggle worthy name, this app is extremely powerful with a variety of tools that have your designs screaming BUY ME! The first amazing tool is the ability to determine your specific canvas size. Not many other apps allow you to create a specific canvas size that make them print ready for your print on demand sites. If you're not selling on POD sites, GET ON IT RIGHT MEOW! The downside is you can only size up to a certain limit, so if you do not have photoshop, you will not be able to resize these images for larger products to sell. However, this is a great starter app for beginner designers. This app also allows you to record you process in a video and share with your youtube, instagram and other social media followers! How awesome is that? Your followers don't just want to see your art, they want to see how it's done. It builds trust amongst your viewers that you genuinely ARE an artist, and not just selling them products. There are a lot of people on the internet who claim to be artists who just steal from others or solely use material that are available in the public domain. That should not be you! you have talent, you have power, you have technology at your hand to create even the simplest of designs that are sellable. Let's face it, anyone can claim a piece of artwork is their's, but sharing your process makes it more personal for your viewers. That's why this app is so important because it allows you to record you process. Even if it's just a background image, everything is sellable or usable later on. The brush set that comes standard with this app is enormous! You can change the settings on each one to give you a large variety to work with. If you're just starting out, you'll love the fact that you can combine layers to blend into one. 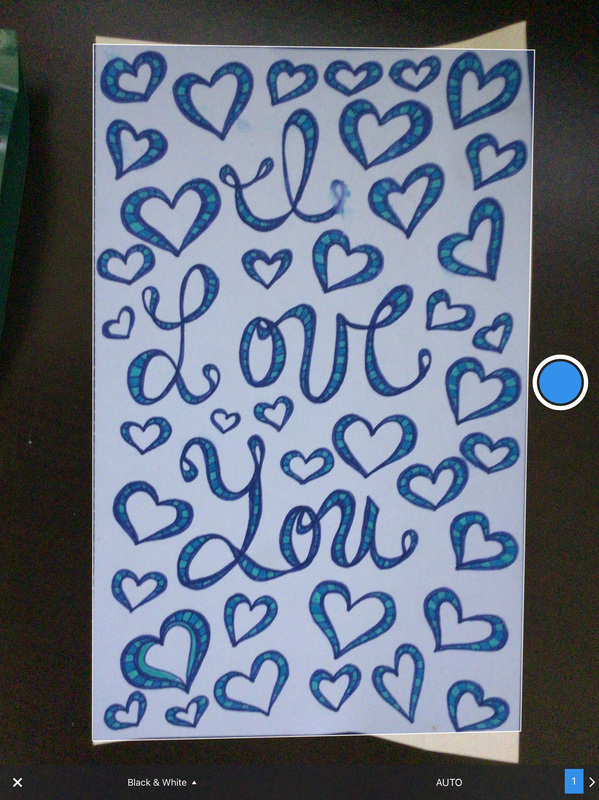 You can see in my image below I have a sample typographical work which combines one layer of digital paint, and a second layer where I filled in the canvas with white paint and then used my eraser to create a colorful typographical text. If you're into lettering and typography and looking to make the jump to digital, this will save you so much money on supplies in the long run. Imagine, making money without ever having to buy supplies. And when you make a mistake, you just press the back button to start again. I love that this app allows you to save your files in a variety of formats including PDF, PSD, JPEG and more. If you haven't made that jump yet to digital, you will really consider doing so with this app. Cost: $5.99 (that's a steal for this app, I think it should be priced at 9.99). ​Itunes App Description: "Apple Design Award winner and App Store Essential – Procreate is the most powerful sketching, painting and illustration app ever designed for a mobile device. This complete artist’s toolbox helps you create beautiful sketches, inspiring paintings, and stunning illustrations anywhere you are. Procreate features ground-breaking canvas resolution, 128 incredible brushes, advanced layer system and is powered by Silica: the fastest 64-bit painting engine on iOS." Filterloop is brought to you by the same app developers who made UltraPop (the app I want to make my future children with...just saying...it's that awesome.) If you're a photographer in search of some outstanding filters and texture effects then you will genuinely love Filterloop. I love to use filters...it's my bread and butter. So when I found out that the makers of Ultrapop created Filterloop, I cried artistic tears of pure joy just because of the large collection of light leaks! You can even resize you filter to make it larger and place it exactly on your image where you want it to go. I live for the texture filters. I went ahead and purchased the extra packages and it was well worth the spend. It allows you to screen, lighten, overlay, soft light, hard light, multiply, color burn, color dodge, difference, and lastly exclude your image combined with the filter simply by tapping on the filter name. With so many different combinations of one filter, you'll get your full money's worth out of this app. It works on both your iPhone and IPad. ​Cost: Free but add ons filters and textures are 9.99 from the standard pack. Itunes App Description: "Filterloop is a premium all-inclusive photo editor that you will fall in love with! There is a huge selection of splendid light leaks, astonishing emulsion effects, grain and scratches. All these create an impression as if your pictures were made using a vintage camera and spent ages in photo albums. We’ve made some of the exclusive light leaks and textures forever free. Enjoy! Have you heard about glitch art? Even celebrities apply distortion effects to their pictures. 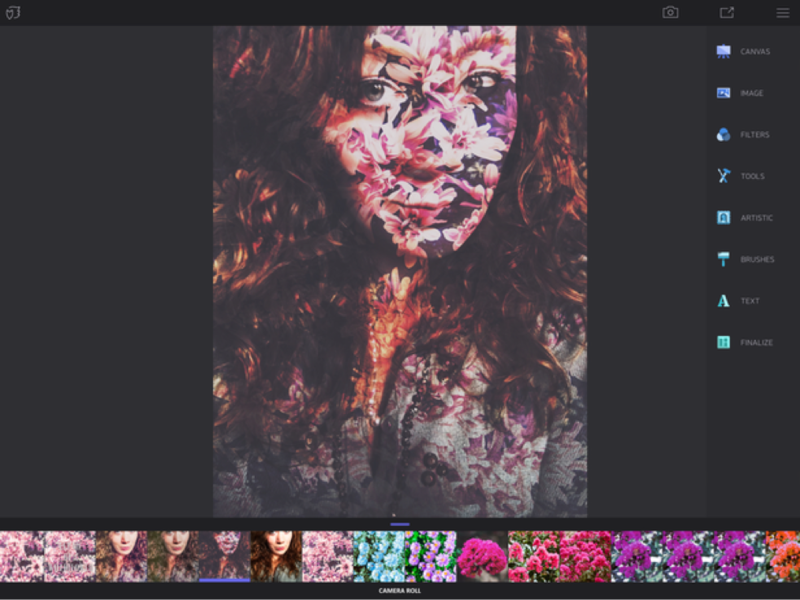 These effects will sure add a fresh angle to your Instagram gallery. Tip: TV Glitches textures work miracles with portraits! When Instagram filters are not enough, Filterloop filter packs come to the rescue with amazing color filters that give your photos that beautiful finishing touch. Our filters are so subtle and focus on enhancing the image rather than altering it. You are free to apply filters with varying opacity levels, and layer effects and filters in any combination and volume. This means millions of different effect combinations for your images. Create your own unique photo editing formula that will be hard to copy!" 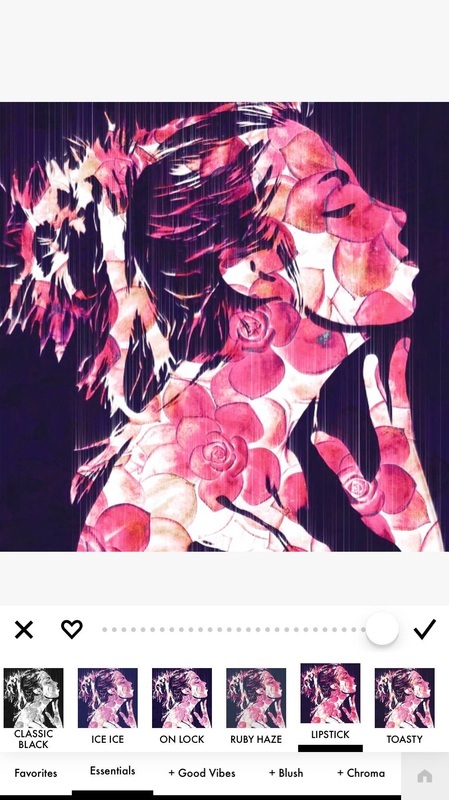 This app is very similar to UltraPop and Filterloop. The setup and appearance and functionality of the app are synnonamous, however, you get numerous of different filters and textures from then app than you would from UltraPop or Filterloop. 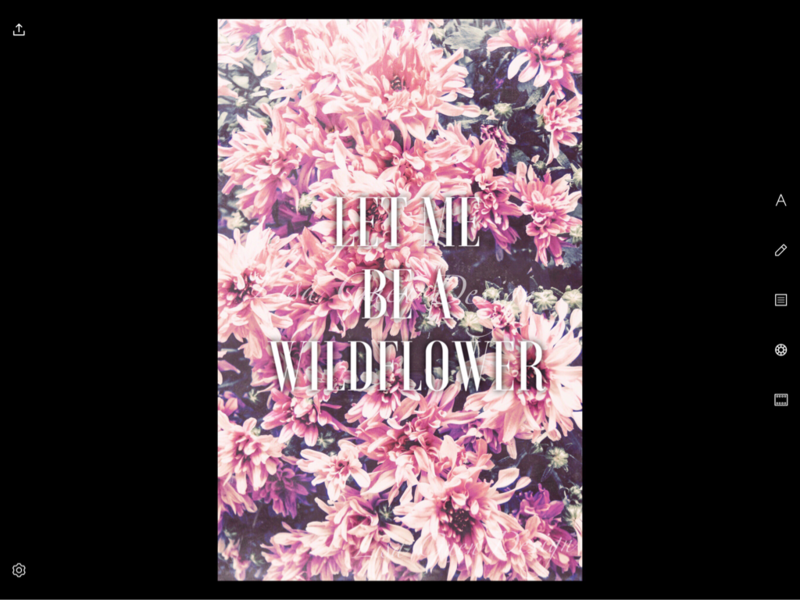 It's aimed to create dreamy style filters with highly vibrant and colorful effects. This is a great app for creating stock images for your blog, promos, etc. I purchased the add on filters as well for this, because as you can tell I have no problem giving my money to app developers who can shake up my photographs and designs to be more vibrant and sell-able. ​Cost: Free (add ons filters and textures are 8.99). Itunes App Description: "Named 'Best New App' by Apple! • custom filters saved from your editing steps"
I use this app for a variety of work, but mainly I use it to create double exposure images. 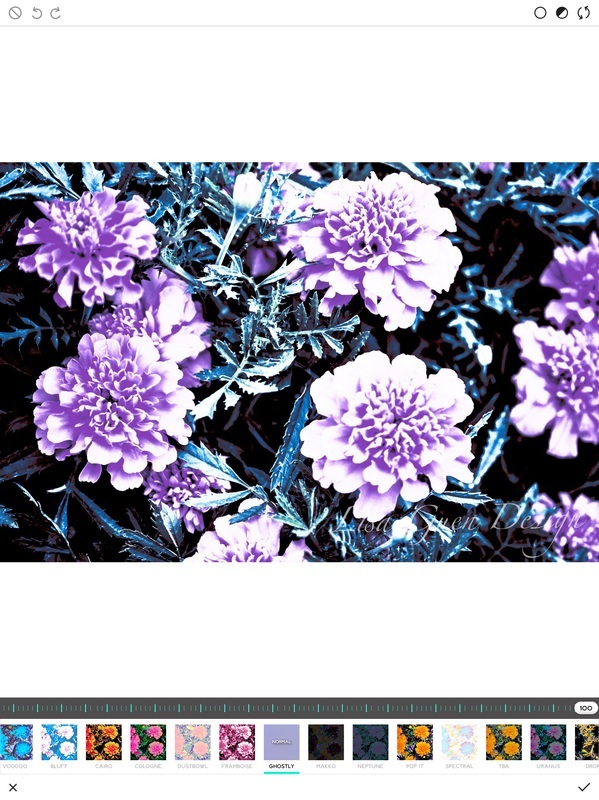 I love to combine my floral photography with iconic and beautiful images. This app allows you to combine the images, and erase any unwanted parts in the photograph. I typically like creating double exposure images in this app than using Photoshop because my brain works like a painter, and I have to physically erase with my hands to feel like I have more control of the creative process. The black and white filters are absolutely stunning. The best part is this app provides free tutorials on how to create double exposure images. And we all like free right? I know I do. Tutorial: Tutorials for this are included in the app but I have also included Enlight iPhone App | Full Walkthrough by 13th Design (btw 13th Design has in depth tutorials on specific effects like double exposure or reflection images for future reference). Itunes App Description: “The best all-in-one photo editor provides powerful tools that are easy to use." - Apple, Inc.
Download Enlight - it’s every photo app you’ve ever needed, wanted, or dreamed of - combined into one powerful, beautifully designed photo editor. " FREE FONTS! Many of the fonts listed in Font Candy + Typography are in the public domain, but you should always double check to keep yourself from running into any copyright issues. I'll be honest, while I love typography, I'm not that great at creating hand lettering. However, that doesn't stop me from trying to create motivational and inspirational images containing short quotes. I just make sure that I either purchase a font from creative market, or mydesigndeals, or use one in the public domain. This is another great app for creating promotional material to advertise to your social media followers. Check out one of my designs below using this app. It's pretty straight forward to use, add your image, add your text, resize, and add shadow to make the text pop from the background. Even cooler is it allows you to pick a cell phone size to design for a specific device, making your designs print ready for posting. Additionally, you can access your photos directly from your camera roll, social media account, google drive, or any other device on your app. I love apps that do the work for you. add loads of flavor to your photos! your photos with captions, gradients, textures and even other photos! While SplitPic is less design focused, I use this app to combine several images into a collage to sell and post images on social media. You need to combine as many images into one when selling a product to get your viewer's attention. 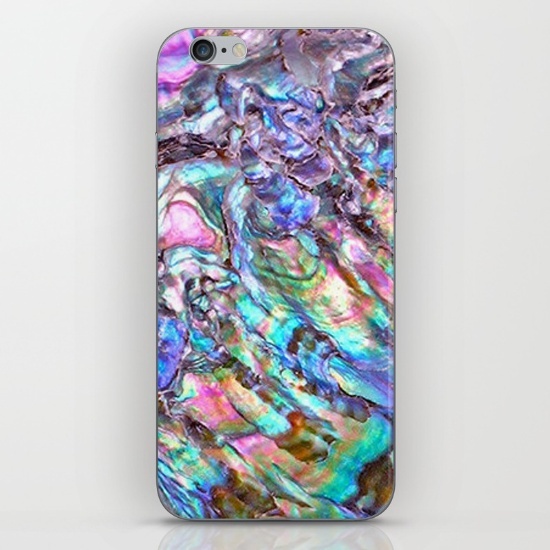 If they see a variety of products with your designs on it then they will be more likely to purchase your artwork . Not everyone needs plush pillow cases everyday but they might need a new tote bag, or wall clock as well. A larger variety of fashion and decor items gives your purchaser choices and opens up your channels. You can see below how I use this app to promote when one of the many print on demand sites I use is having a sale. Itunes App Description: "The (new and improved) Original Cloning App with over 30 MILLION satisfied users! Split Pic Pro divides your camera into several sections with 15 different layouts to choose from. You can choose to blend these images together creating a flawless looking special effect or make a sharp contrast between the photos to collage multiple images. The possibilities are limitless!" 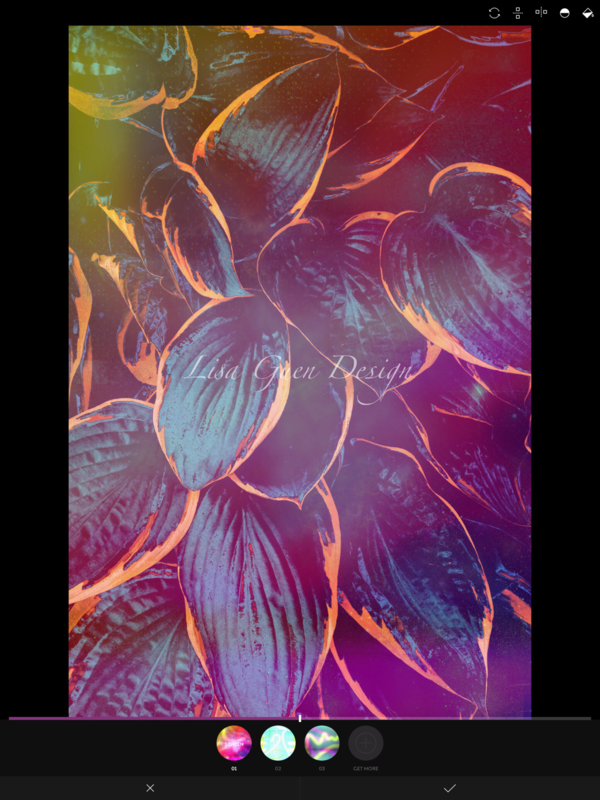 Repix is an app I used to create one of my most popular pieces called "Lee Abstract" which is shown below. I started off using the Adobe Sketch app to create a background and combined the artistic Van Gogh brush (which was additional cost, but worth the price) and I have not regret purchasing this app since. My forte is creating abstract brushstroke pieces. Often I'll do this by hand, but some days I struggle to get the paint set out just to clean and put it away again. I know my significant other Lee probably prefers me to use my ipad. Anybody else an extremely messy artist? One time I found gold paint on the cat....Anywho, Repix allows me to create digital brushstroke abstract paintings of various sizes. Now you can too with the knowledge I've given you. The artistic brushes are mainly what I use from this app, so imagine rein-visioning some of your other pieces into abstract works. 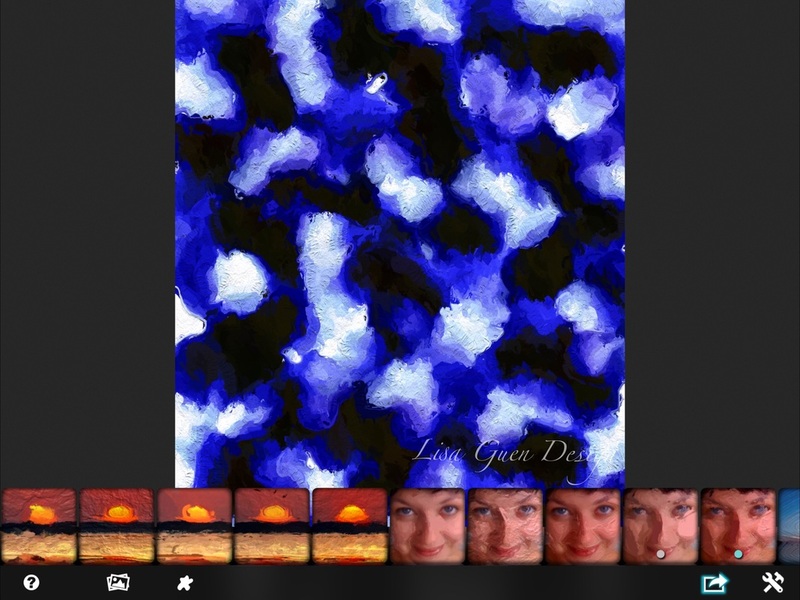 another great app for creating textured backgrounds and works of art. Itunes App Description:Repix is more than a photo editor. 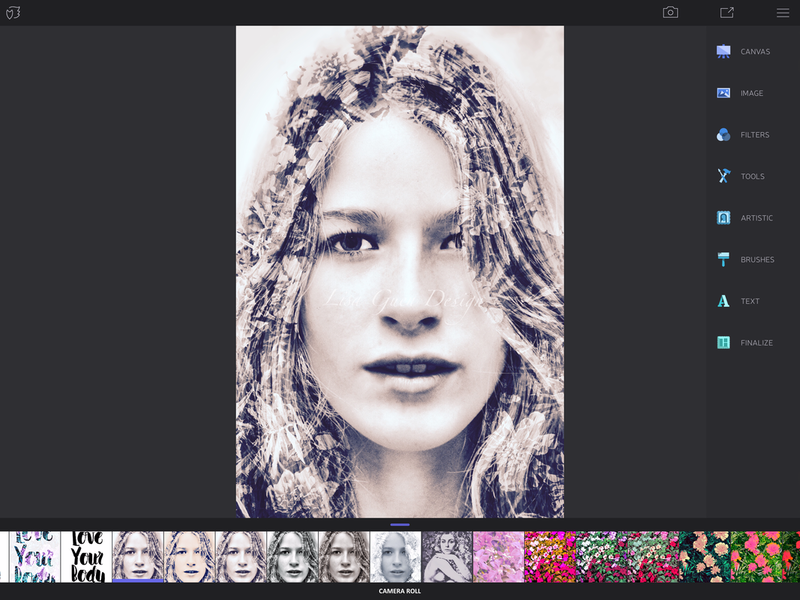 It’s a creative tool that lets you turn ordinary photos into masterpieces. Editors' Choice for iPhone and iPad and featured by Apple in over 100 countries! 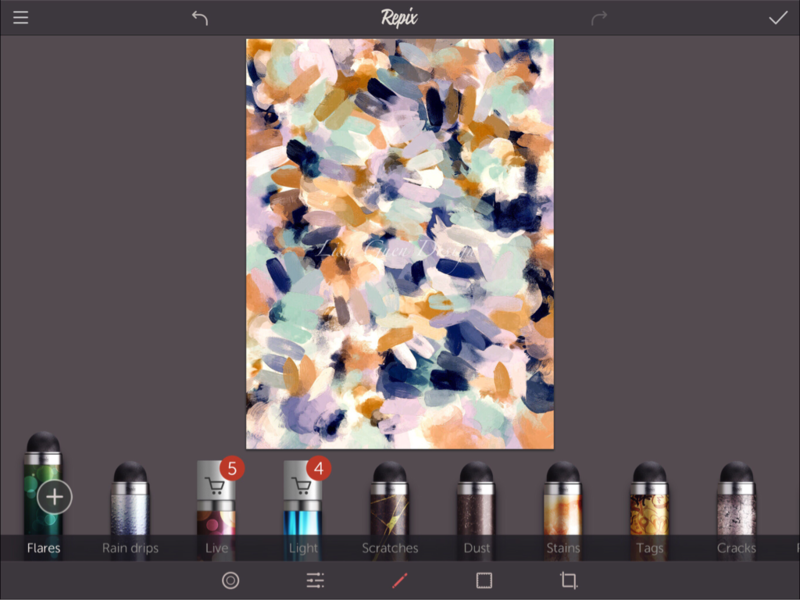 ​Using Repix couldn’t be more simple – all of the tools are easily available at your fingertips and all editing happens in real-time. Use the brushes to freely edit your photos with stunning effects and apply some of the world’s most beautifully designed filters and borders. Repix gives your photos the look you want in seconds! 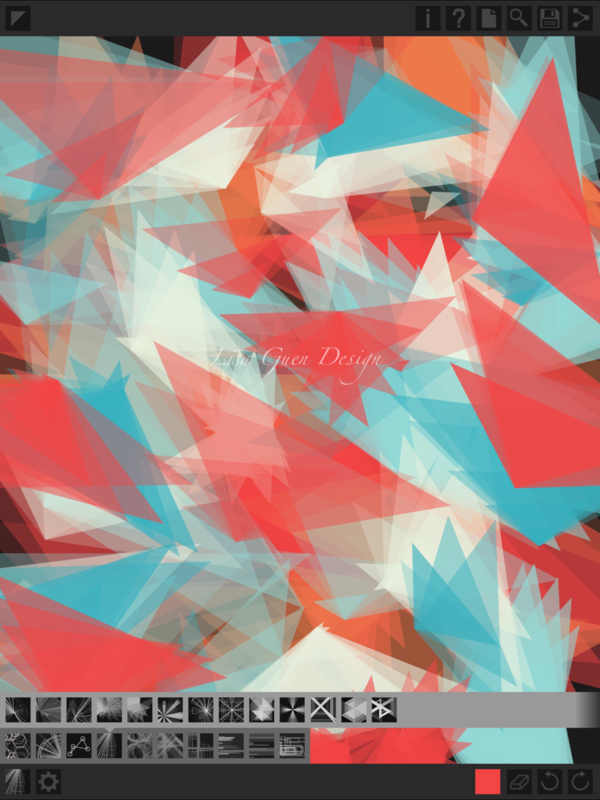 An app that allows you create geometric inspired pieces and abstract works. 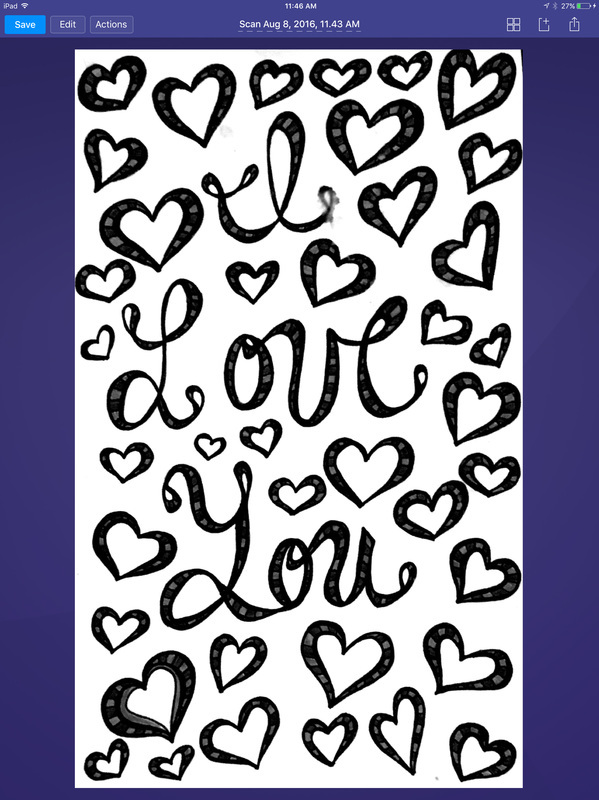 Decosketch has a large number of shape effects that when combined can create some really unique works of art. I often use this app when I need to de-stress and create something abstract. There are so many different shape variations that you'll find it very hard to tire of this application. Mostly importantly you can combine other works of art in layers with the geometric shape presets. I'm a huge fan of geometric art, so if this is an area of design you're interested in pursuing, then it's worth the try. Apps like deco sketch can also be helpful in creating backgrounds for illustrations. Layering textures can be the key to creating more three dimensional designs. I don't always sell every work I create, but I do reuse everything in the grand scale to create and layer textures for other works of art. You can choose to either use an image you've already created as your background, or you can start with a blank canvas which is what I prefer to do. Tutorial: Deco Sketch Techniques - 8bit Figure by Ben Guerrette (fair warning the guy says uh alot and it will drive you crazy but the material is awesome). I watched the rest without the volume on. Itunes App Description: ​Enhance your photos to make detailed masterpieces or minimally affected compositions with Deco Sketch, the geometric effects and drawing suite for professionals and hobbyists. Featuring a diverse collection of unconventional brushes and presets, Deco Sketch lets you organize intricate patterned styles over simple photo filters to produce beautiful, completely original artwork. Geometry....and you thought you'd never use math as an artist. Well this app creates both assymetrical and symmetrical geometric designs based off of photographs and color palettes that you create. Often I will create an abstract painting in Adobe Create, Tayasui Sketches or Procreate and send it to this app. 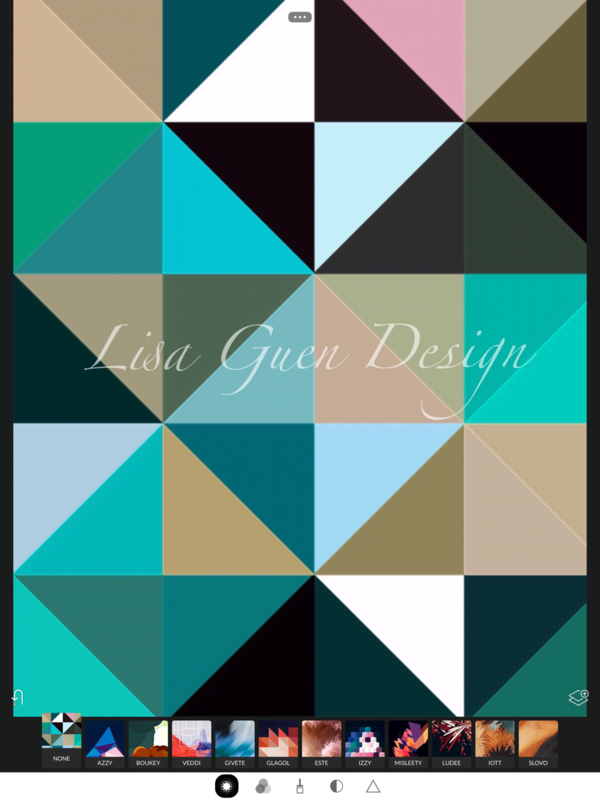 Trigraphy allows me to select the scale of the geometric pattern I wish to create as well as the background image. I can either combine my image to create a screen, or delete the background image as seen below. 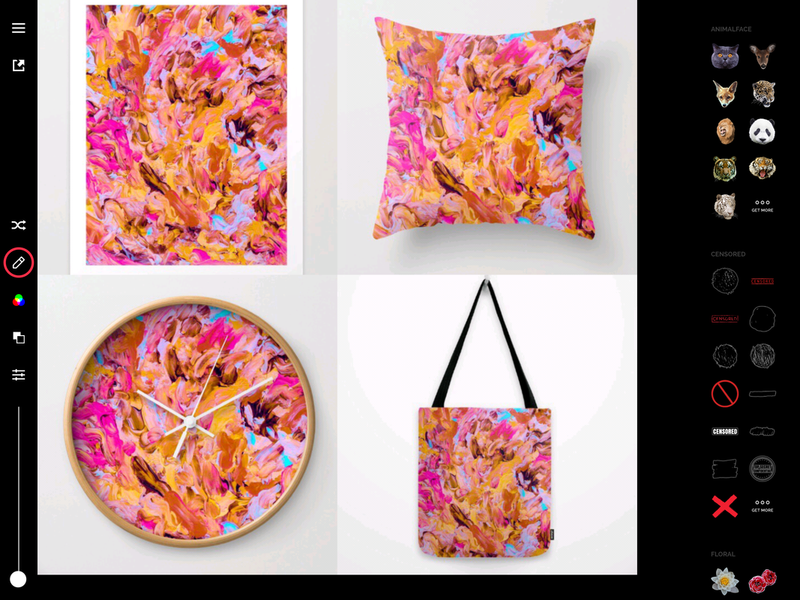 I've created so many designs with this app and have sold within the last month. The key to success is creating as many images as possible. You can take this same image and put it in color thief (an app I reviewed in my previous post) and change the color scheme and sell the same image but with ten different color palettes. 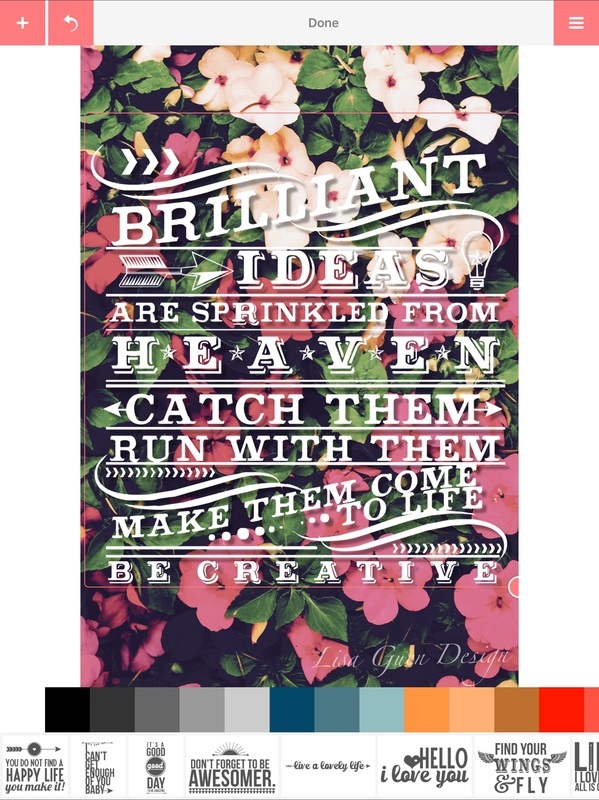 Each color palette will market towards a different audience, so get on that Trigraphy train and sell, sell, sell! You can even save images in 4K for a little bit extra cost. Remember: the larger the image size, the larger products you can sell on POD sites. 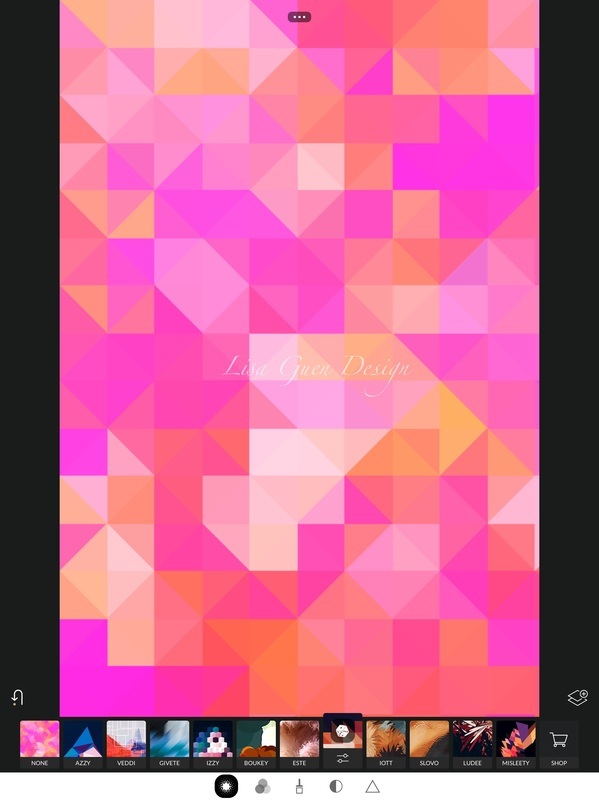 ​Itunes App Description: ​Create amazing abstract art from your images. Easy and simple. Distinctive 11 effects and total of 74 different presets to express your creativity! No matter if you want to make the perfect wallpaper for your phone, artistic Instagram post or stunning print for your wall we've got you covered with export up to 4096 pixels! 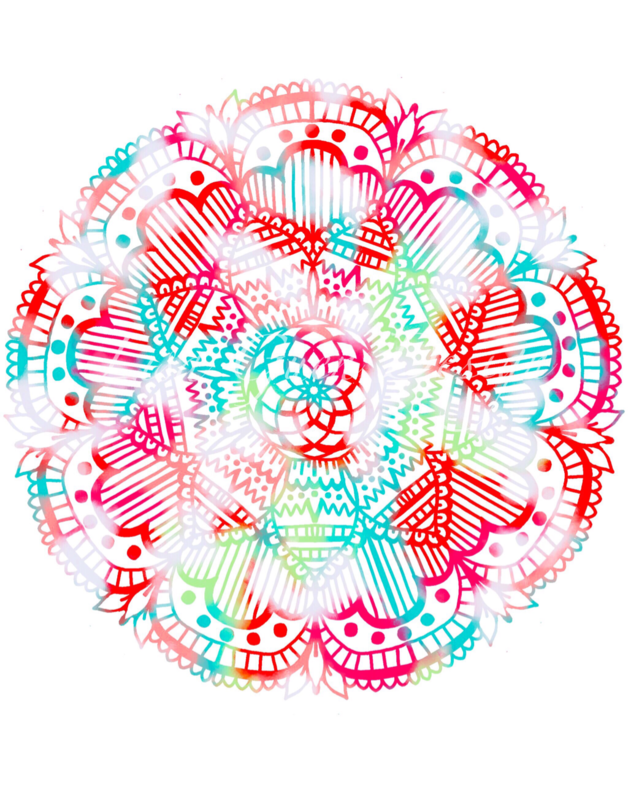 For all of you Mandala creating and obsessive compulsive designers with intense attention to detail (*sips coffee* you know thats you), Amaziograph lets you create symmetrical works without the extra effort. It mirrors your brushstroke between each ruler line, thus creating a perfectly symmetrical work. What use to take me four to six hours to create one piece by hand now take fifteen minutes at most, giving me more time to work on promotional material for my blog and vendor sites. You can see in the second image below how I combined one of my abstract backgrounds and my hand digitally drawn mandala in the Enlight app. If an app can cut my design work time in half and allow me to spend more time marketing then I'm a happy camper, and a money making camper. I highly recommend using a stylus or apple pencil to use this app. I began trying this with my finger tips and it just wasn't working for me because I couldn't see where my brushstroke was going. Tutorial: Amaziograph all Symmetry Types in under 90s each by 1/2 a px. Itunes App Description: In the ocean of drawing applications what does make Amaziograph so unique? Mermaids at Heart and Society Six Lover Unite! In the summertime as a little girl I can honestly say that I wish I was a mermaid. I'd have underwater tea parties with my girlfriends and fling my hair out of the water like the majestic mythical fish girl I always dreamed of being. Can anyone else relate to this childhood fantasy? No...just me...you know you wanted to be a mermaid. 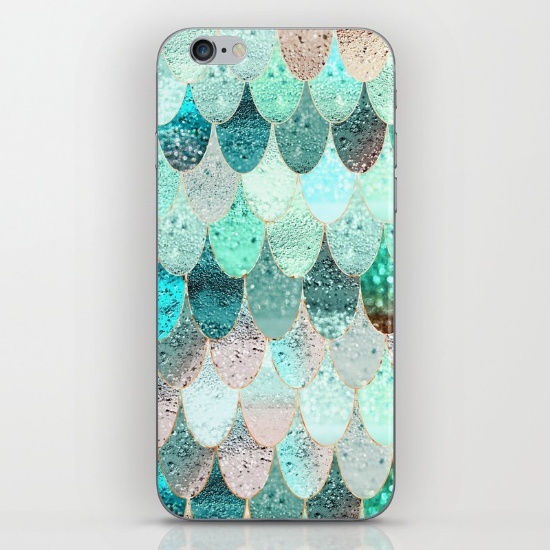 So to help satisfy your inner childhood, I compiled a list of my favorite Mermaid inspired designs on Society 6. 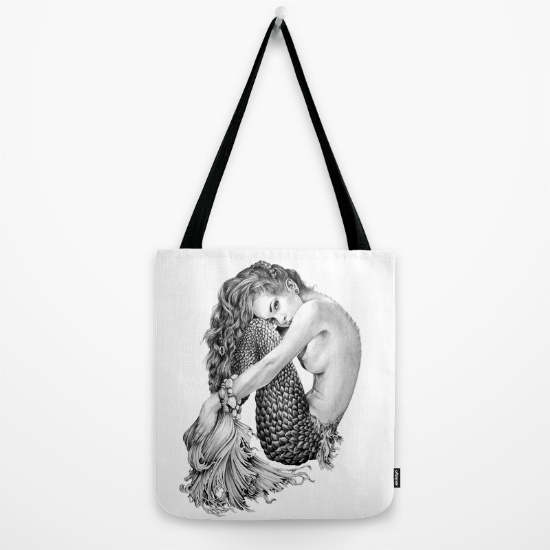 When you purchase a design from Society 6 you're supporting an artist's lifestyle and ability to continue their dreams, so here is my curated list of mermaidesque designs that will satisfy your inner mermaid. 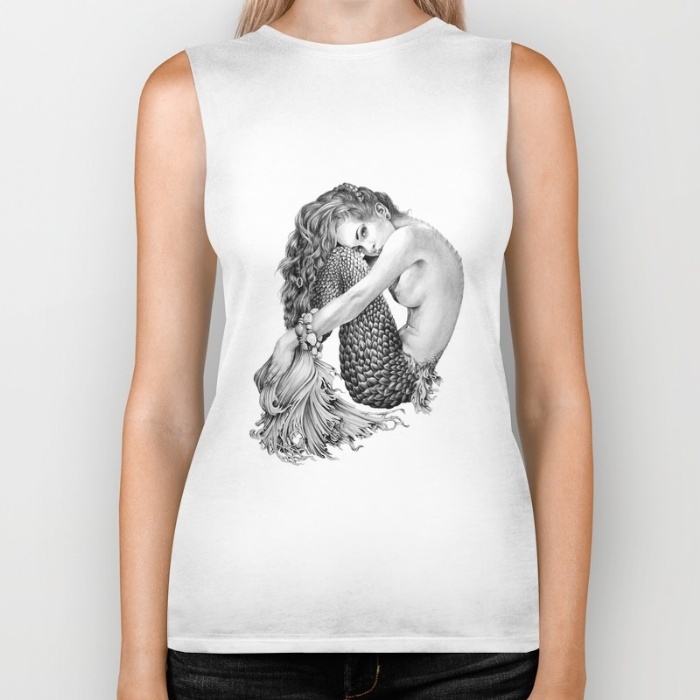 Sylvia Strijk is a freelance artist, living in the Netherlands. 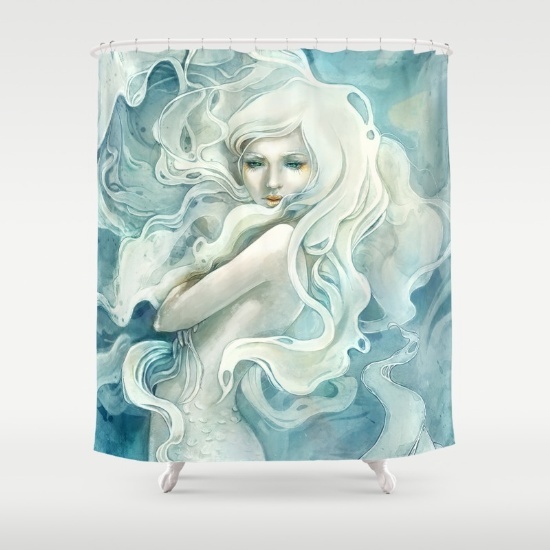 Her works are whimsical and chock full of mythical beauties and fantastical works like this here Mermaid beach towel or this beautifully painted shower curtain. 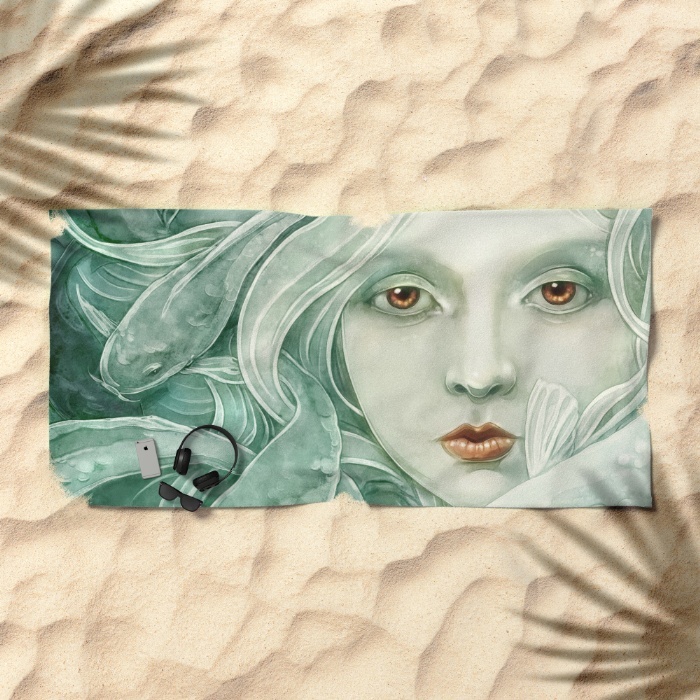 Get this incredibly detailed beach towel on Society 6. 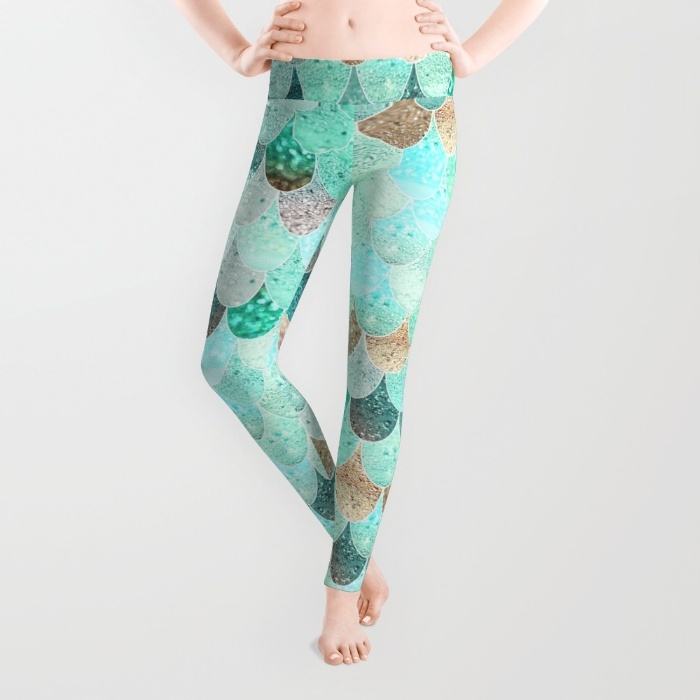 Monika's mermaid scale leggings are way too cute to pass on! I'm a big fan of glitter and these leggings look straight out of a deep sea treasure chest. 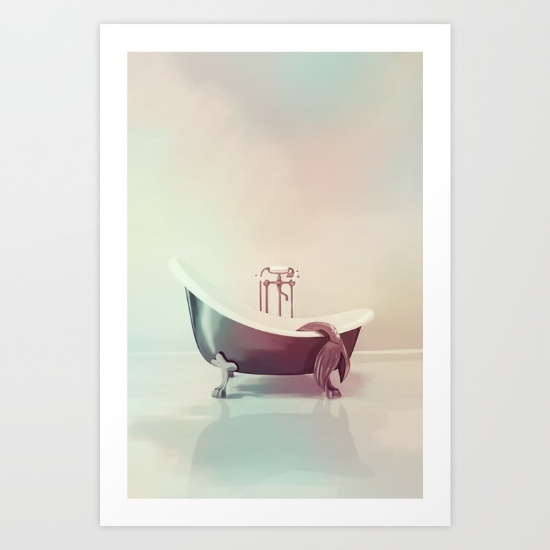 May sure to sign up for Society 6's mailing list so you can get the latest discounts. Let's just take a moment here to bow down to April Alayne's incredibly detailed pencil works. It doesn't get much more perfect than this. Congratulations to April on creating such a beautiful piece of art. I began as a pencil artist and it's works like hers that inspired me to take my designs to the next level. April is a self taught artist from the east coast in love with highly detailed illustrations using a pencil as her weapon of choice. Keep doing you girl. Keep doing you. Elisabeth Fredriksson is an incredibly talented artist from Sweden. 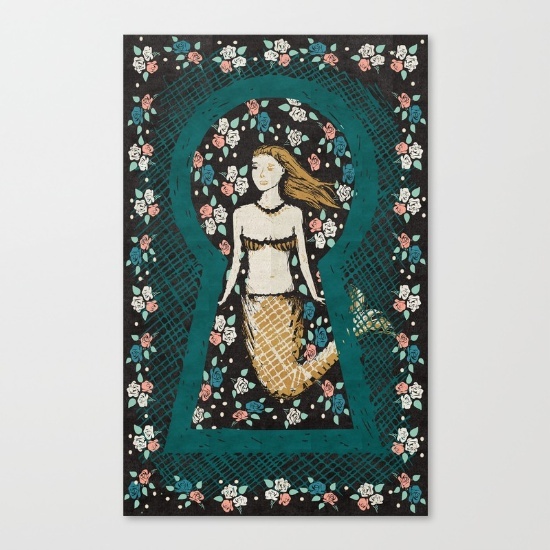 Here works combine photography and illustration into seamless contemporary patterns that will make any mermaid lover drool. It's no wonder she's such a successful designer. What I love most about her works is the consistency in her color palettes in all of her designs. Everything comes together as a collection perfectly. 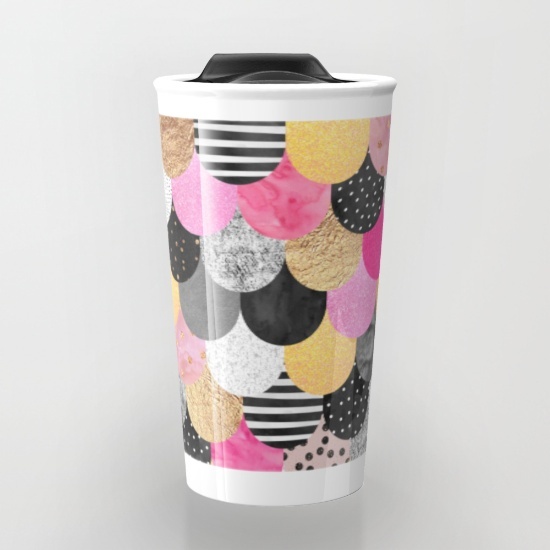 You can always identify an Elisabeth Fredriksson design. Barbarian is an artist I have been following for some time now and I have to say WOWZA! She created incredibly detailed and somewhat abstract patterns by using one of the most difficult mediums I know of. I definitely get some serious artist envy when I look at her works. She's definitely an artist to look out for in the next few months. Wall Tapestries starting at $39.00. This piece has a folk art feel that I was so captured by. The color scheme gives it a vintage feel. David Andrew Sussman's works have a contemporary folky vibe to all of his works and are reminiscent of persian rug designs. It's a great spin on a modern trend. Holy Mother of Pearl this is a gorgeous design. It reminds me of alcohol ink. 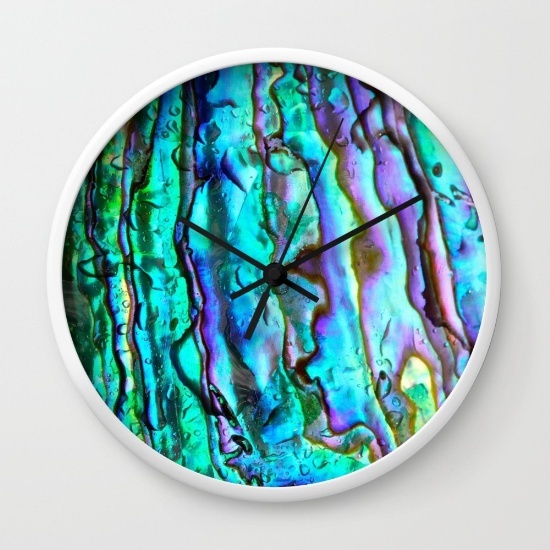 The pearly color scheme to this work will definitely have your home feeling like it's under the sea. 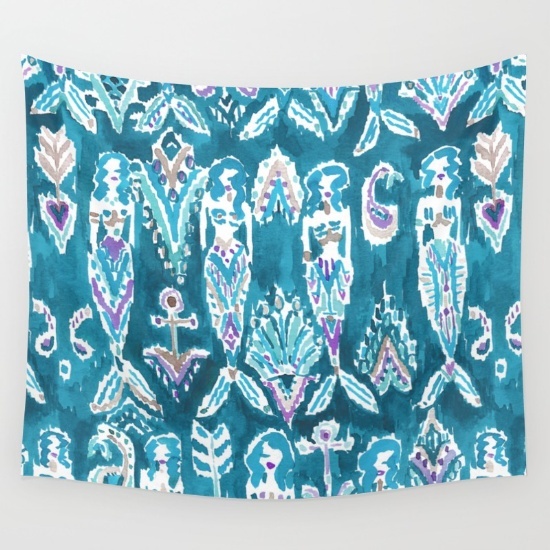 Add some teal streamers to your curtains and you'll be living in a mermaid's paradise. 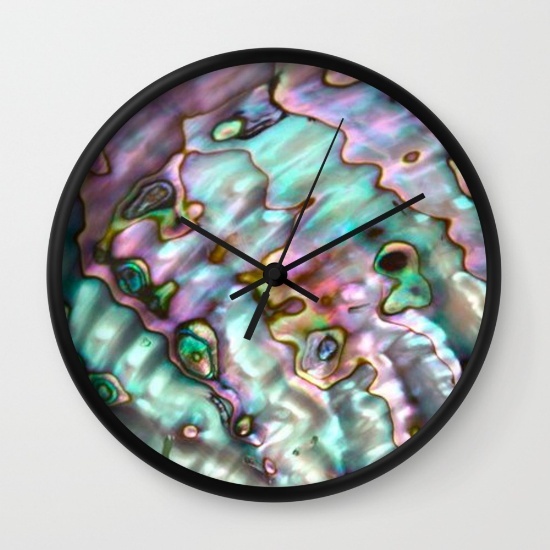 TheMermaidLagoon has a variety of mother of pearl products. 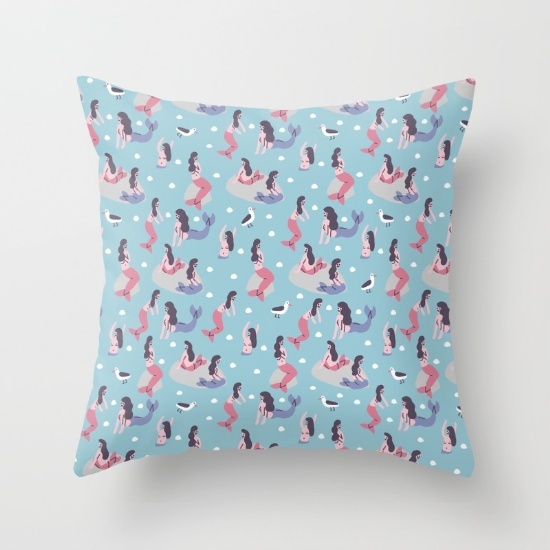 What a fun and quirky pattern! Sara Maese is a spanish illustrator with a knack for capturing the human spirit in her seamless patterns. Every pattern she creates has so much visually to look at. It's as if each character is telling it's own story and the story here is that these mermaids are having way too much fun. I want to join them! How about you? I'm having serious Tom Hanks flashbacks to Splash with this piece. Ssst captures how mermaid lovers often feel. If only my bathtub were the size of an ocean, am I right? What an incredibly talented digital artist. Nas the artist behind Ssst is a half Dutch half French artist who dabbles in writing as well. Nas even shares their process with others on their site. Definitely worth the checkout. Marble. Scallops. Art Deco. So many wonderful elements coming together in Micklyn's mermaid scales inspired designs. The color palette to this piece isn't traditional when you think of Mermaid which is why I find it all the more remarkable. I hope you enjoyed this curated collection and feel free to leave your thoughts below. So you want to be a digital artist, and not just any digital artist, a creative and successful one whose designs sell and who can work full time from home? Over the next 12 weeks, I'll be compiling lists and tools that have helped me go from beginner to expert digital designer in just one year. I'll provide you with lists of sites to sell your work, do's and don'ts of marketing, and techniques for beginning designers. 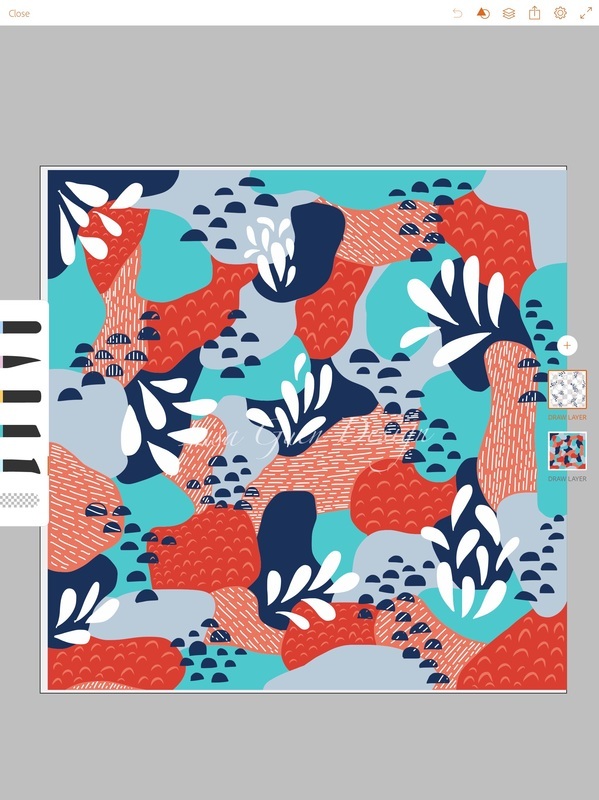 Now, I've purchased many apps in the seven years I've been designing graphics and surface patterns, some apps that should probably never have existed in the world and some that absolutely blew my mind and made me say "take my money and my first born." So to save you the countless hours of your life and dollars I wasted on terrible iOS applications that should go back to the fiery hell in which they were created (ahem), I've compiled my top 12 favorite apps for you to try that will give your designs or blog a whole new look. These apps are all essentials in my designer toolbox and I use them all practically everyday. Now, I'm not saying that you won't eventually need to purchase the Adobe Creative Suite desktop applications like Illustrator, Photoshop or Lightroom. You will eventually need them, but I made a decent passive income off of Print on Demand (POD) sites for years without them until I wanted to take my designs to the next level and could no longer live without them. So if you're just starting out these are great and easy to use applications that won't make you tear your hair out or throw your coffee mug at your computer screen like I do on occasion (is that just me?...okey dokey). This app is quintessential to my livelihood. 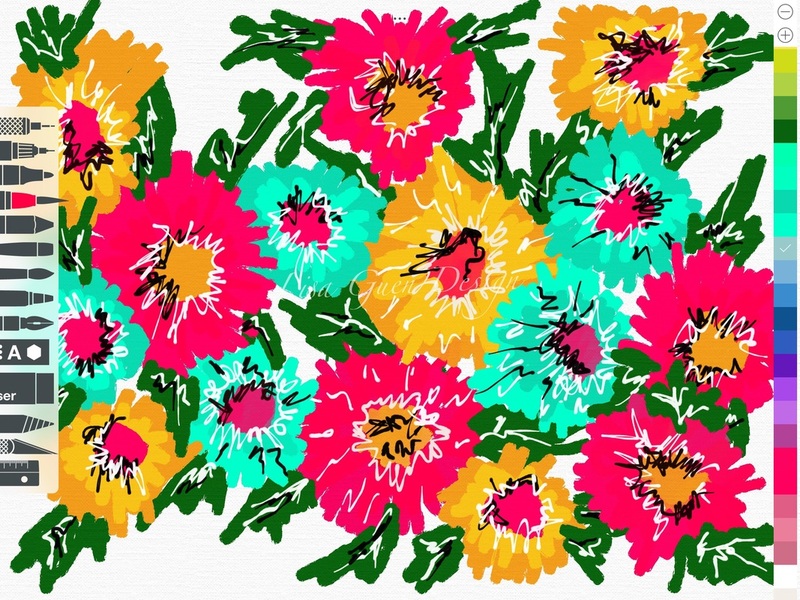 This app is the Beyonce of design apps and will transform those drab pieces to fab in seconds. Here's how it works. You upload a picture that has a color palette you like and it changes your artwork to match the other image's color scheme! I've recolored so many pieces using this app. I'll even sell one design in various color schemes because I know each one markets to a different audience and taste. Click on this link to view a tutorial on Color Thief by Cat Morris. The Adobe apps will always be my hands down favorite. I would number them in order but with all the incredible apps that Adobe provides it would've taken up my entire top twelve list easily. While these apps don't replace the desktop apps, you can always send them to your desktop applications by using your creative cloud account. They're also linked to your Behance portfolio (get on Behance and share your work, it'll create more traffic to your work and can generate sales). Here are some perks of each individual app. Adobe Capture allows you to create color palettes based off of pictures and us them in other adobe apps as well as on your desktop. 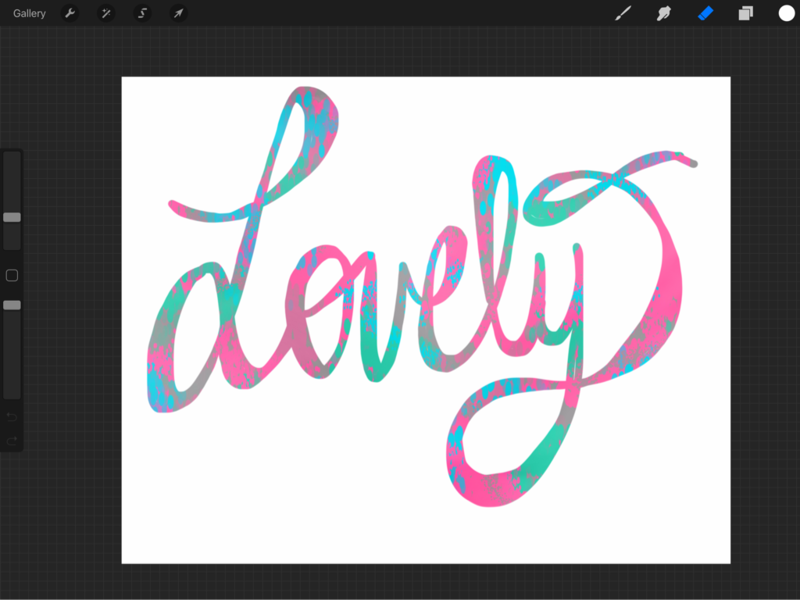 It can create patterns using your artwork, You can customize brushes and create your own brushes for Adobe Sketch. Simply paint a brushstroke on paper and "capture" it through your camera lens in the adobe CC app and you can use that brush in any photoshop iOS or desktop app. 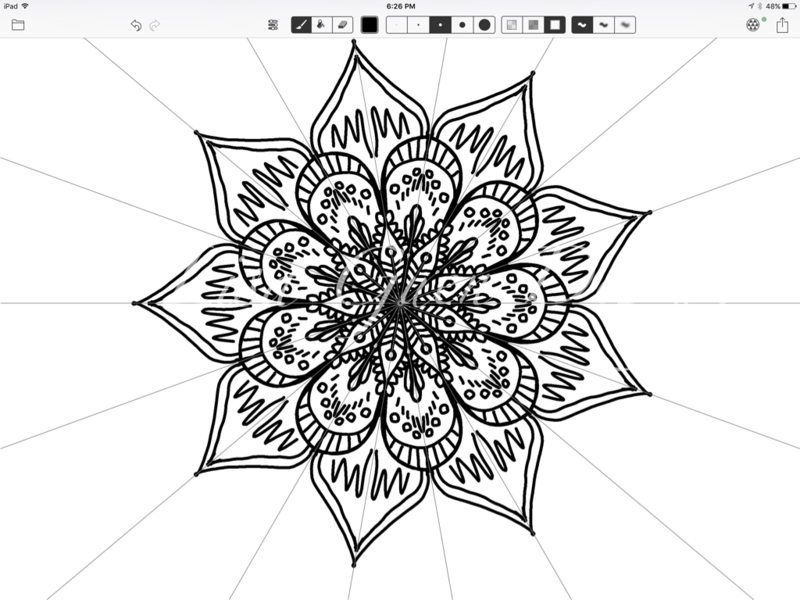 It also allows you to create custom shapes based off of images you draw to trace over in Sketch or Draw. Adobe Draw creates vector drawings. It's intention is to be like Adobe Illustrator. I wish they had more brushes like Adobe Sketch but it works well for creating layered drawings. I love the undo swipe left feature. I probably use that feature the most....I mess up a lot and I'm very particular so I love this feature more than drawing on actual paper with ink. I've actually transitioned from drawing on paper to solely using this app and it has saved me so much money on ink and pens. You can easily fill a shape by selecting on the inside area of a shape. 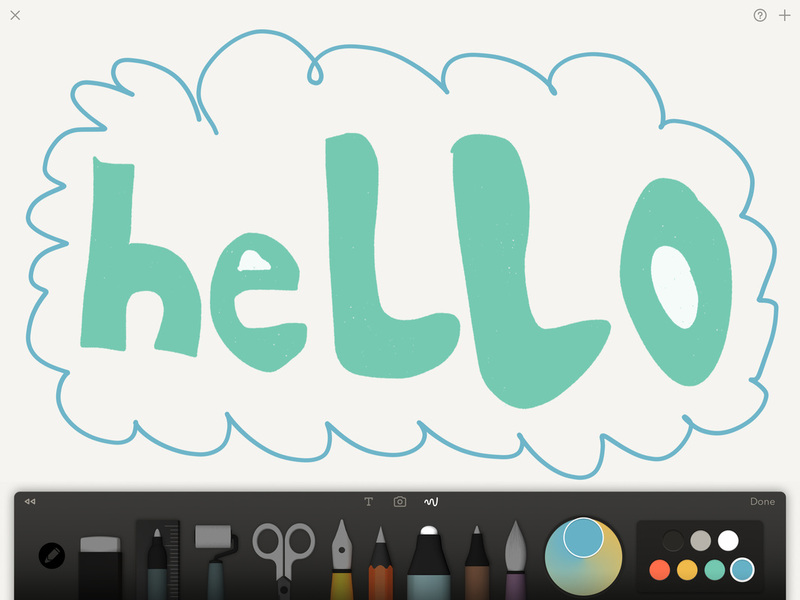 Adobe Sketch is more like drawing on paper. You can't fill shapes like in Adobe Draw but you get a larger variety of brush textures with this app. I actually recolor a lot of my photographs and artworks in Adobe Lightroom. I love vibrant colors so this app allows me to fine tune the saturation, vibrancy, and clarity. I create a lot of abstract artwork and it helps enhance the texture on my paintings that may not show up when you first scan in your work. Overall these apps are worth it because they're free and Adobe will always be the leader in design applications. If there was an app that I would marry it would be this one. I just recently found this one a month ago and the first time I used it I did a happy dance so embarrassingly awesome I was sure my dog Louie was contemplating running away forever. I absolute love this app. It changes your artwork into Pop Art color schemes. 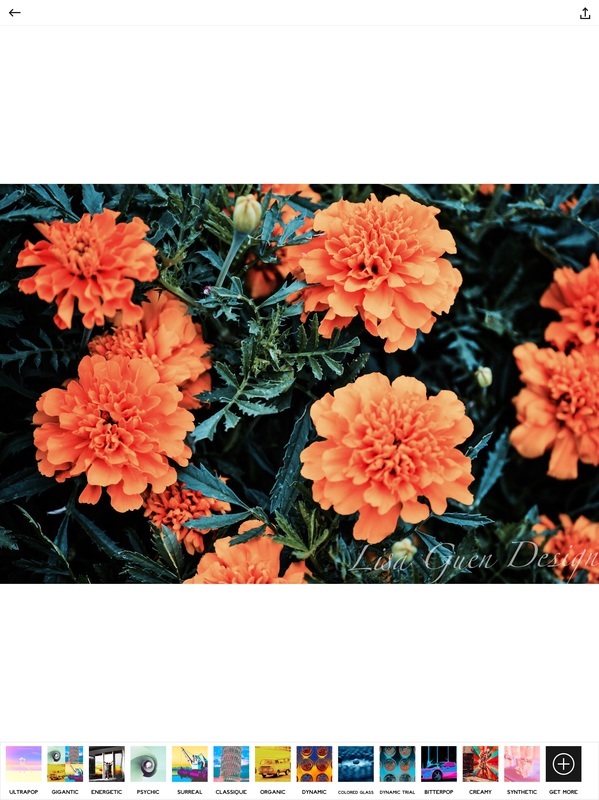 Now not all of the color schemes work for my art, because some filters have intense color burn and pixelated textures, but it's great for photographs and watercolor works created in Adobe Sketch that can give your designs a whole new colorful and vibrant appearance. I often work on pieces and feel like "I hate that piece" and because I'm a perfectionist I use to throw away pieces I didn't like. DON'T DO THAT! Save all of your work because later down the road you'll use it or transform it or add to it, I promise. I'll often paint with random colors and recolor them through apps. It's saved me a lot of money in paint first of all, because I can just go into this app and recolor it to a theme I find more visually appealing or sellable. For the longest time I didn't realize that if you clicked on a filter in UltraPop it actually provides a variety of styles to just one filter. It allows you to create a screen, hard light, multiply, color burn, color dodge, difference, exclusion, lighten, overlay, soft light filters. It's worth the money to upgrade and get all the filters. 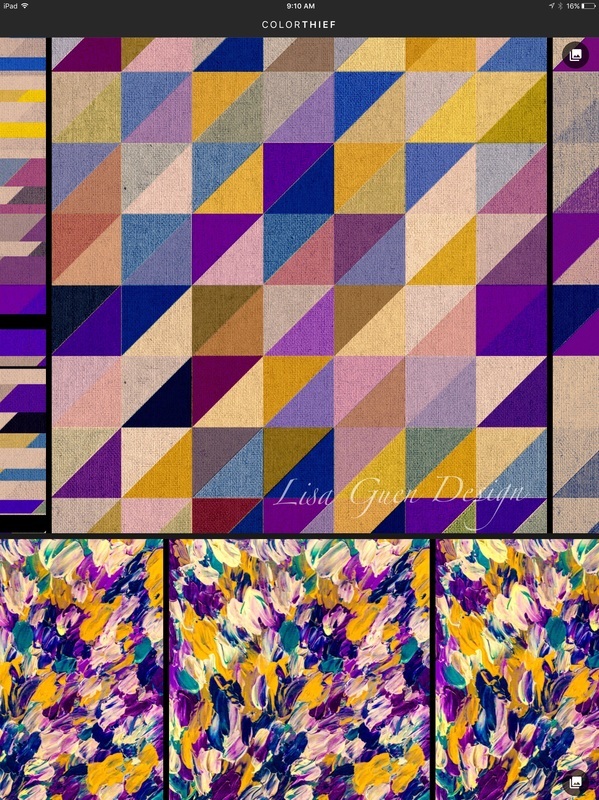 The color schemes are endless with this app and you'll never get bored with it. Here are examples of my works before and after Ultra Pop. Cost: Free but definitely worth purchasing all of the filter packs. People! You need to watermark your work, especially if you plan to share it anywhere online. There is a huge problem with people stealing designs off the internet and POD sites and taking screen shots of your work and then selling them for way cheaper and crappier quality on Amazon. First of all you don't want people stealing your work, you worked hard for those designs and nobody deserves to profit off them except for you. Do not share any digital work unless it's watermarked, especially on social media. I once had someone I was friends with for years on Facebook selling my work and claiming it as theirs. We are no longer friendsies to say the least. Eventually we'll talk about how to market on social media but for now watermark everything or sign everything you! iWatermark provides a lower quality resolution to the image so even if someone did try to go in and photoshop your watermark out (which yes people do that....those little nasties) it'll deter them from reproducing the image at such poor quality and getting terrible reviews. It also allows you to create a custom made watermark with either text or graphics. 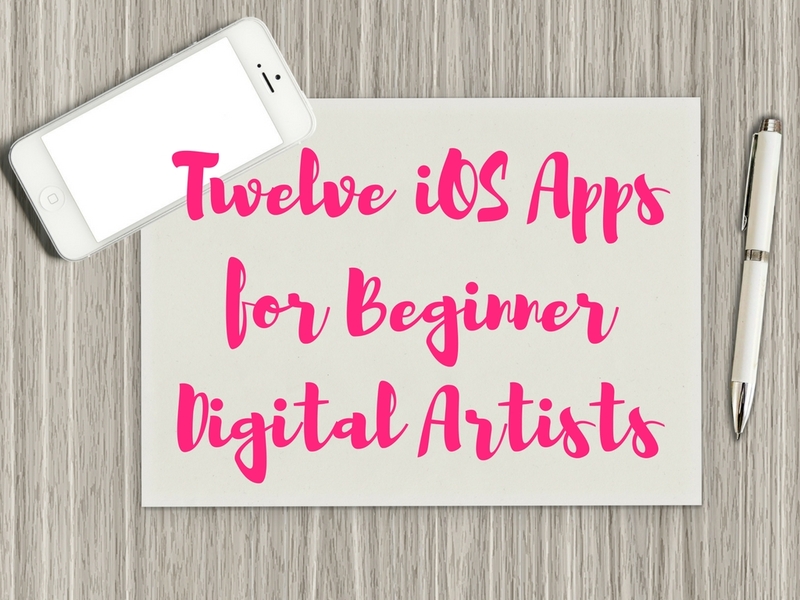 If you're a beginner graphic designer then this is the perfect app for you. Also if you're terrible at drawing then you'll love this app. Wait....you don't have to know how to draw to be a graphic designer? Nope. You just have to have a basic understanding of layering shapes together to create larger images or texts. Designing is often more mathematical than having a surplus amount of creativity flowing through your veins. The Assembly app allows you take shapes from a provided list (and it's worth the 10 dollars to upgrade to get all the shapes!) and combine them to create logos, banners, patterns, words, etc. It's so easy to use, you just click on the shape you want and place it on the artboard and click on the link button to combine them. You can also unlink them if you want to go back in and edit the shape sizes, colors, etc. Here's a link to a tutorial on how to use the application. ​Cost: Free but worth the $9.99 upgrade to get all the shapes. I have yet to master this app probably because it's very simplistic and my brain doesn't work well with minimalism, however, I've seen some amazing tutorials and works created using this app and it's extremely easy to use. I've watched many tutorials on creating typographical works using Paper and they're stunning. Youtube has some bomb diggidy tutorials on how to create designs with Paper. It's also great for taking notes or creating quick sketches. The best feature about this app are the brushes. The only way to control the amount of ink or paint int the brush, however, is to go pro so it's definitely worth the purchase to upgrade and get all the features. I love that you can paint or draw with textures. The calligraphy pen is beautiful and close to what I imagine writing with an old school ink well pen would be like. I also like that this app allows you to blend colors together or create new layers. It's definitely fun experimenting with the different brush styles. It also has a undo swipe left feature like Adobe Creative Suite Apps. Did I mention you can also download this app on your iPhone, iPad, and Mac? This is a great app for bloggers. 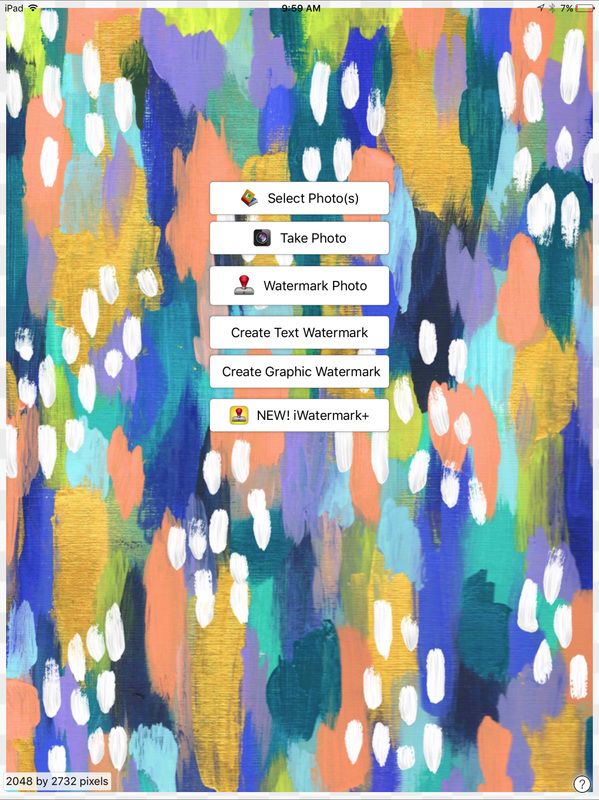 You can't sell any designs that you create using this app because the templates and most of the fonts are all copyright of Rhonna Designs, however, if you need a blog header or to add text to image this is a great app because it provides high resolution images. You can also purchase packages with cute seasonal or holiday images. Rhonna is constantly updating the app with new features, texts, and graphics to use. My favorite feature is the gold glitter or gold foil overlays for text. You can change any color of the text or template, and create shadow outlines to make your text stand out from the background. It wasn't until about four years after I started designing that I was able to purchase my first scanner to upload my drawings. In the mean time I used the Scanner Pro app to upload either black and white pdf files or jpeg files to sketch or paint over them in other apps. While the Adobe CC app can do this same feature for capturing basic shapes, the scanner pro app captures more detail in your drawings or illustrations. If you ever need to scan a large image, you can always take it to a local Kinkos and get it scanned by a commercial scanner. However, for small projects that shouldn't cost you and arm and a leg to get scanned you can always use the Scanner Pro app. It also sends faxes, emails, and uploads files to your google drive. I've recently been expanding my portfolio to include more geometric and abstract works. 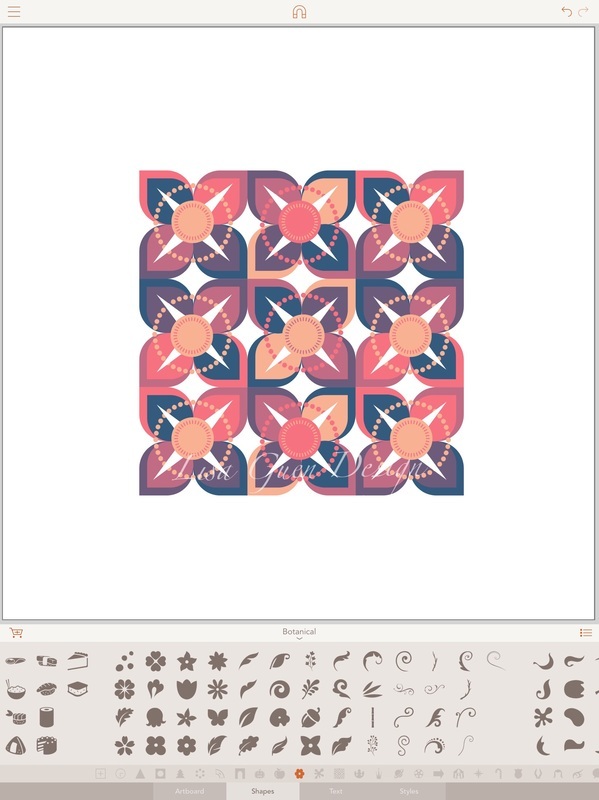 This app allows me to paint an image in another app and create a geometric design based on image below. 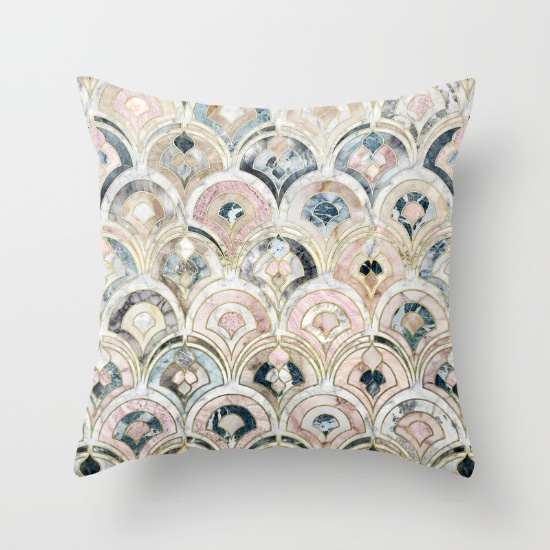 There are more than 20 great texture filters on this application as well as it allows you to fine tune how large or small you want the geometric pattern or shape to be. It's worth purchasing all of the extra filters and features on this app. 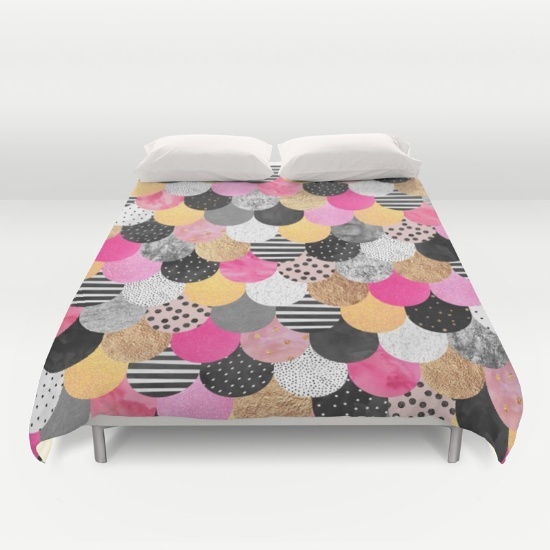 Typically I use this to create geometric pillowcases to sell on Society 6. Once you do you'll be able to download 4K files (large file types with high resolution) of your work and transfer it to photoshop and resize for selling. This is a very popular app that I feel really deserves a trophy for bloggers and web designers. 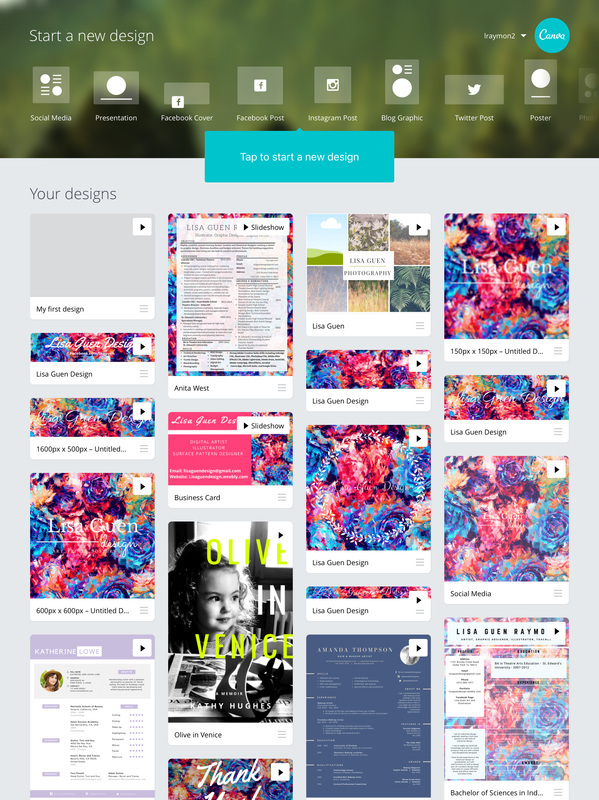 It provides a variety of templates that you can personally transform for your particular tastes. Whether it be for an instagram post, or a header for your blog, or social media header, it's completely free and worth your time to learn how to use it. It's so easy to use just by dragging and dropping items. Plus you can use it on a desktop and it always saves your designs. I created my business cards and all my social media graphics using Canva and even created a resume template which I sell (sell everything you create, just make sure you're not using copyright material, use your own designs, your graphics and revamp a template to make it your own and then make bookoos off it!). It's such an awesome app that even businesses are requesting that social media specialists on indeed.com know how to use this app. So think of it as an investment in your future, because you could potentially get hired to do someone else's graphics for their blog or website one day. It's like InDesign for beginners. Free Tutorial by Canva here! ​Cost: Free for simple version or $1.99 to go pro. I just use the free version. Texture!! Exclamation point, exclamation point! Seriously, this app is great for overlaying paint like textures to images. I've hand painted images in Adobe Sketch and then export my image to glaze to experiment with textures. It adds a little something extra to your designs to make them appear more three dimensional. I wouldn't recommend going pro on this one unless your focus is abstract works. The simple free filters should do just fine for adding simple textures. I love any artwork that has such intense texture it makes you feel like you want to eat it. This app will make you hungry for your works. Enjoyed this read? Leave a comment or question below. Stay tuned for my next blog post. Top 12 Sites to sell your Designs and Make A Full Time Passive Income. Lisa Guen Raymond is a former professional theatrical designer and teacher located in the state of Texas. She has a passion for art and education. The Purpose of this blog is to educate others about new and trending mediums in art, illustration, and graphic design.